This post is about connecting two posts that might not otherwise meet. Almost two weeks ago, Greg Mankiw posted this image, calling it "not completely fair, but funny nonetheless." I saw several follow up posts in my reader, including an entertaining caption contest post by John Cochrane. Cochrane's caption, "When you're done, another half box will magically appear on the wall." In unrelated news, Steve Landsburg wrote a post today about "Triumphs of Capitalism" in which he offers evidence of our abundant wealth (by historical standards) by pointing to recent innovations that are so frivolous that we could only afford them if we were wealthy. His second example, The Useless Machine, struck me as a capital-intensive video version of Mankiw's comic. 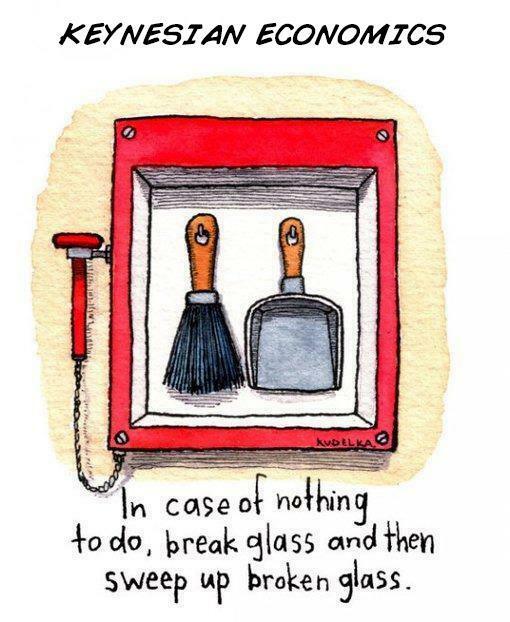 To modify Cochrane's caption from Mankiw's comic, "In case of nothing to do, flip switch and the machine will turn itself off." If you were wondering, you can have such a machine for $30 (Canadian Dollars), plus the time it takes to assemble it. Their website claims having sold over 14,000 Useless Machine assembly kits. As a high school econ teacher, I love your blog and visit often for ideas. FYI--- after Dr Mankiw posted the original cartoon, I sent him the link to my blog where I posted the cartoon that he later added to his post. I thought he might be amused, and I was right!!! He did not cite the source, which is ok. I was surprised to see it pop up elsewhere. 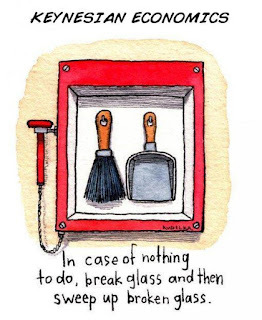 I actually created that "Classical" version myself after seeing the Keynesian version last year. I use it with my students to give an introductory idea of the popular, humorours versions of the philosophies. I am not taking credit for the sentiment, just putting it together in the cartoon. Opps...here is the link to the blog posting where I originally put the cartoon.